Home / NEWS / CAMPAIGNS / Could you spot the signs of stroke? Could you spot the signs of stroke? 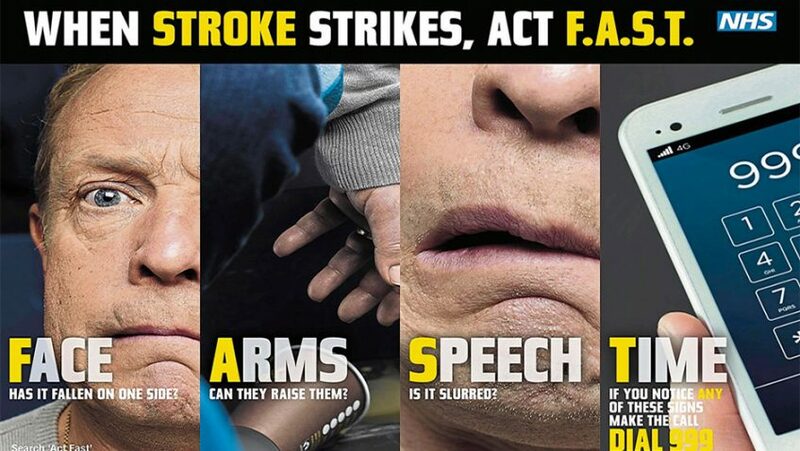 You may already be familiar with the Act F.A.S.T campaign, which is designed to help people know and remember the signs of stroke and call 999 as quickly as possible if they notice even one of the signs in themselves, or in others. 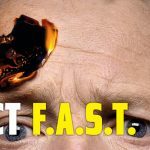 Public Health England (PHE) has relaunched the Act F.A.S.T stroke campaign to increase awareness and understanding of the signs of stroke, as new figures reveal that in 2016, 57,000 people had a first time stroke in England and around 30,000 died from a stroke. According to National Institute for Health and Care Excellence guidelines, in England, one in six people will have a stroke in their lifetime. Stroke is the third most common cause of premature death and a leading cause of disability in the UK. Deaths related to stroke have declined by 49% in the past 15 years and this has been accredited to a combination of factors, including better prevention and earlier and more advanced treatment. Timely treatment can reduce the risk of disability and death, so calling 999 immediately, even if you are unsure, is essential. Around 1.9 million nerve cells in the brain are lost every minute that a stroke is left untreated, which can result in slurred speech and paralysis. While the majority of strokes occur in the older generation, PHE’s figures also found that over a third of first time strokes happen in middle aged adults, that is, those aged 40 to 69. Getting an NHS Health Check, for those aged 40-74 years, can identify early if you are at risk of a stroke. Public Health England’s re-launch of its national Act F.A.S.T. stroke campaign aims to remind people of all ages to be aware of the symptoms and call 999 urgently at the first signs. People with certain medical conditions are more at risk of having a stroke. This includes people with conditions such as diabetes, high blood pressure, high cholesterol and atrial fibrillation (an irregular heartbeat). The Stroke Association’s latest State of the Nation report reveals that in the UK, almost two thirds of stroke survivors leave hospital with a disability: around three quarters of stroke survivors have arm or leg weakness, around 60% have visual problems and around a half have difficulty swallowing and loss of bladder control. 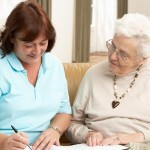 Communication is also affected in around a third of stroke survivors. Tony Rudd, National Clinical Director for Stroke with NHS England and stroke physician at Guy’s and St Thomas’ NHS Foundation Trust, comments: “Thanks to improved NHS care, stroke survival is now at record high levels. Urgent treatment for strokes is essential, so friends and family can play a key part in making sure their loved ones receive care as quickly as possible.